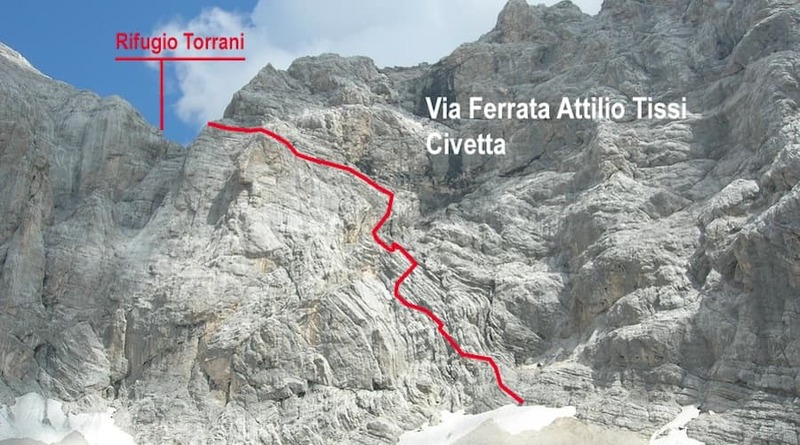 The combination via Ferrata Civetta is a perfect target for strong hikers in good physical conditions. Don’t miss the opportunity to climbing the via Ferratas Costantini and Alleghesi in a sequence on three days trekking hut to hut, it will be a unique experience on great walls of the Dolomites! Basically you need have the level of training for about 10 hrs of walking per day, then if you have a basic experience with the scrambling on the rock is sure good, and last…..you will be impressed for the incredible expositions in great altitude of these walls! This combination of via ferratas is the hardest of the Dolomites. 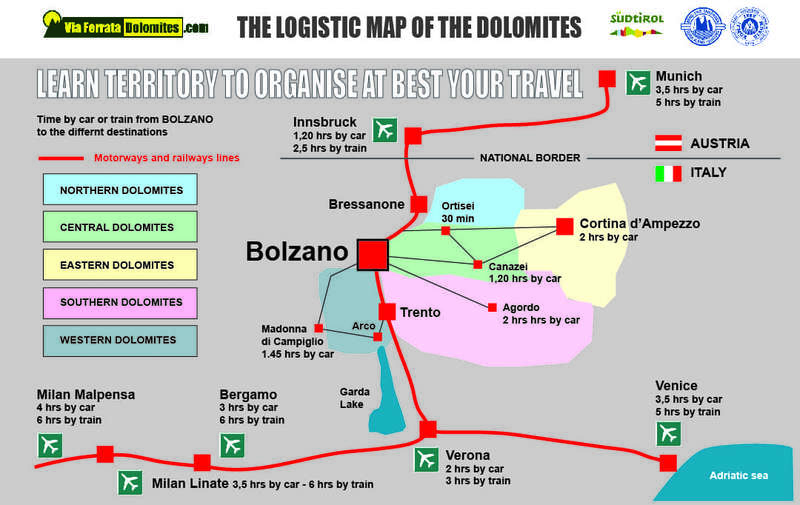 Logically is possible to do it only with good weather forecast…..
We start very early from Bolzano, at 05.30 (yes you have read right… 05.30) and we travel to Alleghe in two hours by car. I park my car in the town and we take the cableways of Alleghe to arrive at the Col dei Baldi, here begin our “long day”. 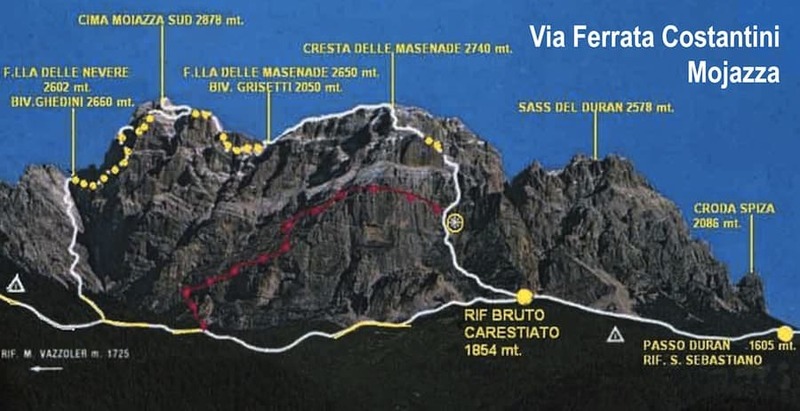 In about 2.30 – 3 hrs of hiking we arrive at the beging of the Via Ferrata degli Alleghesi” ,that we climb in about 5-6 hrs to the top of the Civetta peak (3220 m.), along the infinite north crest. Then with one hour of scrambling we descent on the east side to Rifugio Torrani (2601 m.) where we overnight. Rifugio Torrani, for his particullar position, is one of the best place of the Dolomites to enjoy the sunset on the evening and sunshine early on the morning! 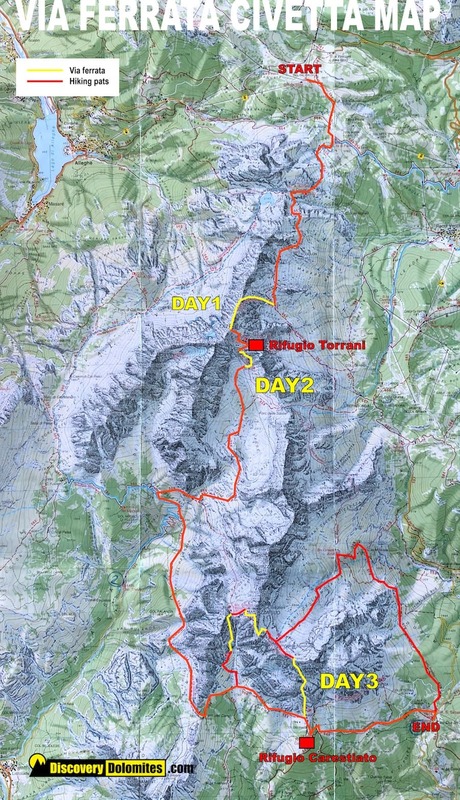 The second day is a long transfert from the Civetta area to the Mojazza area. 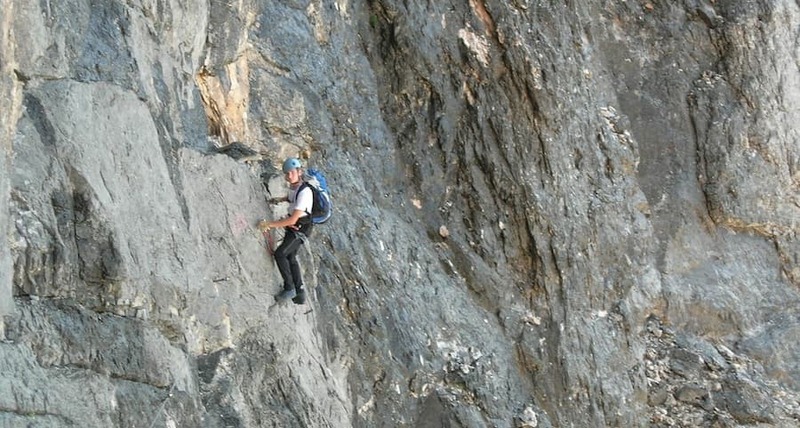 To do it we descent immediately the “not easy” Via Ferrata Attilio Tissi to access at the “Van de le Sasse”, a internal rock plateau on the south side of the Civetta. We traverse it in south direction to circumnavigate the Mojazza area troughd the Forcella da Camp and arrive finally to Rifugio Carestiato. 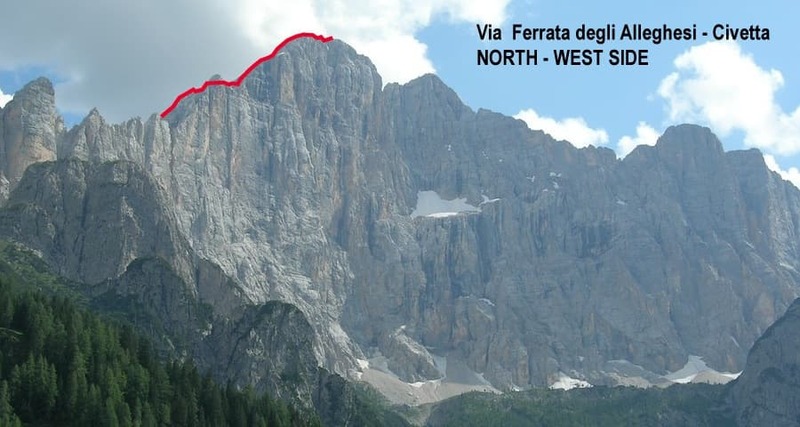 The long last day is dedicated at the “longest via ferrata of the Dolomites”: the Via Ferrata Costantini at the Cima Mojazza south. A second particullarity of this great target is the technical difficult…. really not easy in some points….. for a so long via ferrata! Don’t worry… if you are overlived until here you will have good possibility to overlive at the “Great Ferrata Costantini” and go back at home to tell a unique experience on “the big walls of the Dolomites”! The last day we descent at the Duran pass, then with local bus or taxi (extra cost) go to Agordo. We take a short visit of this amazing mountain town in venetian style, and then continue with the local bus to Alleghe to take my car and drive back in Bolzano. A great ending of a unique experiance!